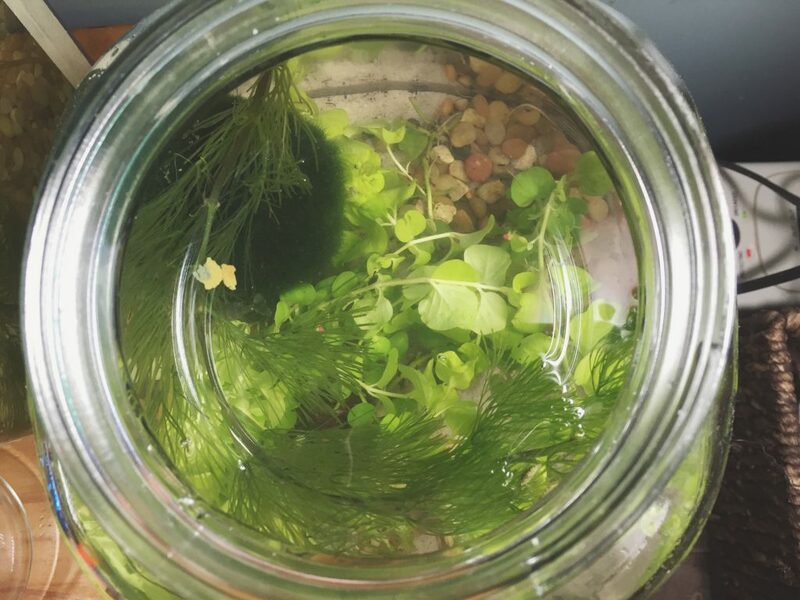 Two days ago I started a planted Shrimp bowl following this article from Diana Walstad. Except I didn’t quite follow it. I thought it would be okay to use the organic garden soil I had instead of the Miracle Gro organic potting soil she recommends. BAD idea. I didn’t read the bag closely enough and it contained fertilizer other than compost. Never assume! So Tuesday Morning I came down to one dead shrimp (started with 5), and the other 4 were super sluggish, and Seymour the snail had locked himself in his shell. I had a second bowl with just treated water and some creeping Jenny I had floated in there to root, so I just scooped everyone out and dropped them in the backup bowl. I wasn’t sure if that would shock them, but I thought the water was probably toxic. Then my five year old and I embarked on an experiment to diagnose the problem. Within a few hours, the shrimp were all happily zooming around the second bowl, seemingly recovered. One of them did molt, but then it had been very stressed lately, lol. We tested the water in the first bowl only to discover the Nitrite and Nitrate levels were through the roof. The Nitrate registered at 160ppm (highest the test goes) and the Nitrite at 5 ppm. The second bowl was registering 0.25 ppm on the Nitrite (possibly because transferred the plants without rinsing them, hindsight! ), and 0ppm on the Nitrate. The Ammonia in both bowls was 0.25 ppm and the pH was in a good range for shrimp at 7.4. I left them in their emergency bowl for 24 hours, went out and bought a bag of the Miracle Gro Organic Potting soil. I spread out about 4 cups on a tray and let it air out over night. I read somewhere about letting it off-gas just to be safe, so I decided I wasn’t taking any more chances. Then I sort out the biggest pieces of bark and wood this morning until I had two cups of soil. I added that to the bottom of the bowl (bowl is actually a 1 gallon cracker jar), and then slowly poured in about 3/4 a cup of water. I then added my two creeping Jenny plants. Note, this is regular creeping Jenny, but it’s been in my garden for about 6 weeks, so I figured it should be pretty safe to add since it’s rained a lot! 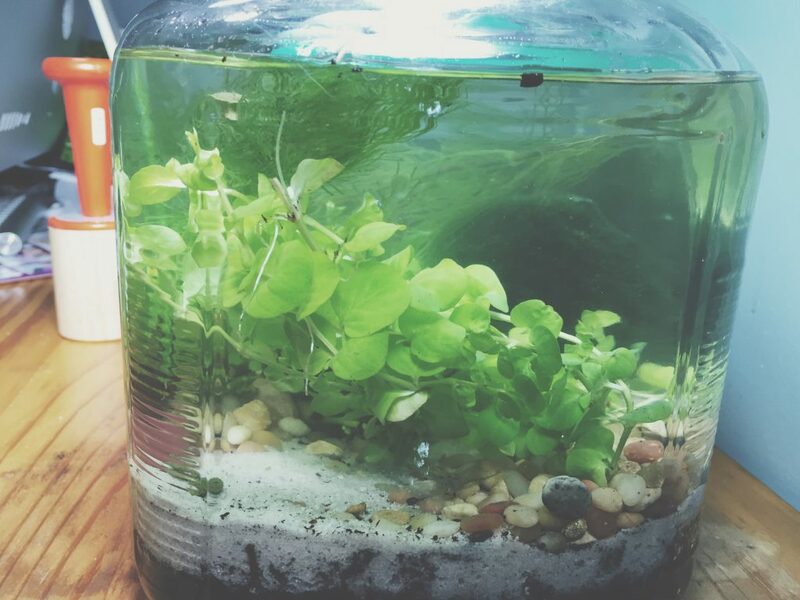 Everything I’ve read says it will grow submerged, and I’ve seen pics of it in other tanks. So far, so good. I’ll let you know if it starts to melt. I put in about a cup of play sand (from Lowes. 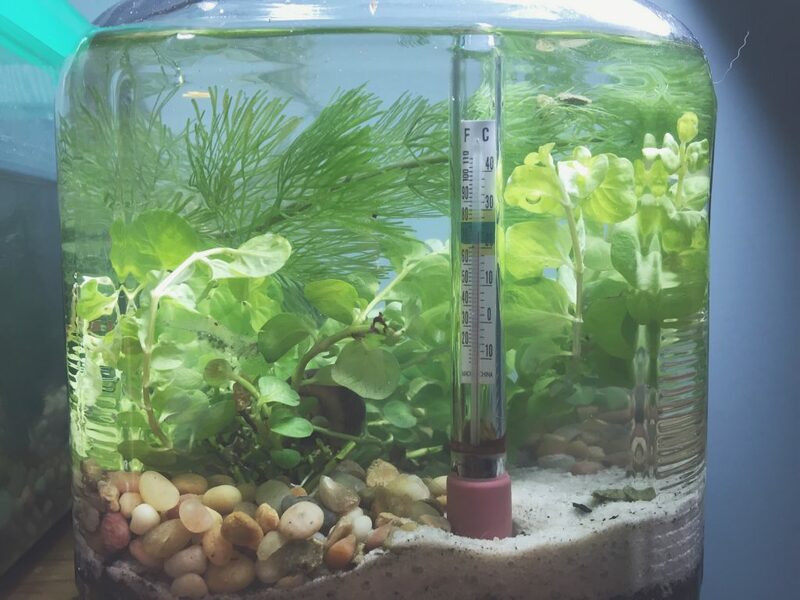 I soaked some in water for about 12 hours and tested the water to see if it changed the pH at all before I used, and it didn’t) to cap the dirt, and then added a bit of aquarium gravel around the bases of the the plants to help keep the roots down and help them become established. Then I filled the bowl up by slowing pouring water from a jelly jar over my fingers and the largest plant and gravel. It was cloudy and some dirt still floated up, so I scooped the water back out with the same jar, which pulled a good deal of the floating bark into it. Plus when I lowered the water level enough, most of the other floating bits stuck to the higher parts of the glass, and I just wiped them off with a paper towel. I did that about 4 times until it was clear. Then I treated the water with Seachem Prime (Just one drop from a medical dropper is enough for a gallon), then I reduced the water down to about 3 cups. Yes, after I treated it, stirred it, let it sit, I then dumped some of the treated water. This is because a gallon is the least you can reasonably treat with Seachem Prime, and I didn’t want to over treat it. I wanted to add the water from the emergency bowl into the new one to provide as little water shock as possible, so this constituted about a 30% water change for the shrimp. I’ve read you shouldn’t change more than 20-25% ideally as they are very sensitive to changes. I carefully picked the plants out of the bowl the shrimp were in, and put the Marimo moss ball and the strand of Cabomba (bought from a local fish store, or LFS if you’ve started reading forums, lol! ), to the new bowl. Then I scooped most of the water out and added it to the new bowl, and added a little reserved new water to the old bowl. Then I ended up having to heat the new bowl with a mini heater (Jamberry for the win!) from the outside because it was so freakishly cold here this morning that the room temp water I had to fill the bowl with had gotten chilled to about 60 degrees whereas the bowl under my grow light (clamp light with daylight CFL bulb) was sitting at about 73 degrees. Obviously I wouldn’t heat water from the outside with small heater with the animals in the bowl, but this worked since I don’t have a bowl heater and wasn’t planning to use on as the house should stay about 71 even at night once it decides to be summer. I turned the heater off, stirred the water to equalize the heat, and let it sit. 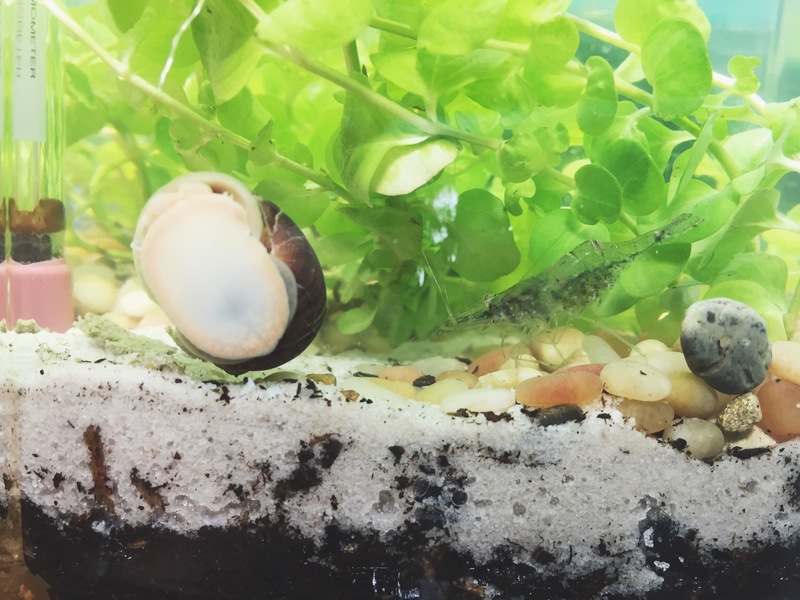 Then I scooped up about 4 oz of water in to a jelly jar (so about half way full, captured the shrimp with a net, which was easy since there wasn’t anything else in the water for them to hide behind, and put them in the jar with Seymour the snail. Then I floated the jar in the new aquarium. The plants held it upright, and I was able to just let it sit there. Then after about 10 minutes (maybe I should have waited longer, I read 5 minutes of floated, plus 5 minutes with new water added was the minimum recommended for adding new critters, and they had been sitting with some of the new water added for at least 30 minutes, and then I floated them until the water in the jar was the same temp as the water in the rest of the bowl), I gently tipped the glass and let the water flow in and the shrimp swim out. Seymour had locked down after being moved so he sort of drifted into the creeping Jenny and hung out for about an hour before he started exploring. pH: 7.4 on the high pH test), Ammonia: 0ppm, Nitrites: 0ppm, Nitrates: 0ppm.